A video interview lets hiring managers know which candidates know how to give an effective presentation. Unlike phone interviews, which are fairly one-dimensional, a video interview requires candidates to think about their visual presentation as a whole. Is the lighting good? Is the candidate’s outfit appropriate for a video interview? Does s/he speak loudly enough? A candidate who does all of these things well knows how to make a good presentation, and you can be sure that s/he will represent your company well. 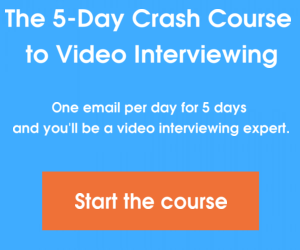 One-way video interviews allow candidates to answer a hiring manager’s set of questions on their own time. This means that they have the ability to give their answers some thought before-hand. While the phone interview shows which candidates think on their feet, one-way video interviews show which candidates can provide a well-thought-out response to a challenging question. The ability to compare candidates side-by-side is one of the greatest advantages of video interviews. Because video interviews are recorded and stored, hiring managers can re-play an interview as many times as needed to make the correct decision between two candidates. You can even bring in more stakeholders to help you compare the interviews. Try doing that with a phone interview! Do you think video interviews should replace phone interviews? What are the advantages? Disadvantages? Leave a comment below, and start a conversation!